Explaining a concept to an unfamiliar audience requires more than expert knowledge—you need to be able to adapt your message so it’s relatable and thought-provoking. Records management, with its myriad rules and regulations, can sound almost like another language to the untrained ear. But employees who don’t understand the importance of electronic records management are unlikely to follow its rules, leaving the organization at risk and the records manager constantly frustrated. We asked a group of over 3,000 records managers on LinkedIn how they explain records management to regular employees who do not share their expertise or daily business goals. Here are eight takeaways from that discussion. Records management is knowing what you have, where you have it and how long you have to keep it. By starting every client conversation with this slogan, Rich is able to ease any anxiety caused by the changing regulations, practices and legal ramifications of records management. Besides the CEO, the records manager is one of the few people who has a comprehensive view of the organization’s methods and operations. This knowledge is collected over the years through information audits and policy reviews, giving the records manager keen insight into the routines of regular employees. Records managers can use this global view to address “throw it over the wall” thinking—i.e., when departments pass off responsibilities to the next department without considering the impact on organizational efficiency. A common example of this is when one department passes a paper form to the next department, which then has to enter the form data into its software system—using a consistent electronic form would save time for everyone. Once records managers help regular employees understand they’re all part of the same team, those employees might be more receptive to sharing the duties of records management. Records management, like IT, exists to support the infrastructure of an organization. It is crucial that employees view records management not as a resting place for unneeded documents but as a set of principles that must be followed in every department and process. Who are your customers or clients? What are your pressures or pain points? What consequences do you have for errors or non-compliance? With these questions answered, records managers can explain records management and the useful role it plays in the day-to-day lives of regular employees. If the message of the records manager tends to fall on deaf ears, change the speaker. One LinkedIn member used video recorded messages from his organization’s CEO and Chief Ethics and Compliance Officer to roll out a new records management program. In his case, it was crucial to go beyond C-level approval and have executives actively advocate the records management initiative. When employees claim that records management is too complicated to handle on their own, it helps to relate organizational records management to personal records management. For instance, home life requires you to sort mail and throw out what you don’t need, keep some mail until an action is completed (such as paying a bill) and retain other pieces of mail as required (such as tax documents). In this way, records managers prove that regular employees already practice records management to some extent, making it less alien of a concept. The main distinction is that in an organization, everyone must follow the same rules and the consequences of non-compliance affect more people. Certain people require dramatic examples to be shaken out of apathy. I am in no way endorsing the idea of staging an emergency in the records storage facility, but it can help to go over the worst-case scenarios of non-compliance. For example, one wealth management firm experienced a six month FINRA audit that essentially put business on hold. According to one LinkedIn member, sharing these horror stories prompts action from regular employees without much effort from the records manager. This approach should be made with caution as employees might replace arbitrary recordkeeping behavior with record hoarding, which can still put the organization at risk. 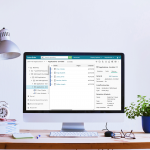 Electronic or automated records management can make compliance easier for records managers and regular employees, so why would anyone resist the idea? One LinkedIn member emphasized the importance of phrasing records management initiatives so that employees focus on the direct benefits, such as taking on more valuable tasks, improving service and freeing up office space. On the other hand, records managers should avoid associating an automated system with staff reduction. Ultimately, some people need to realize the importance of records management on their own and not because someone gave them a list of rules. With these employees, it helps to let them explain records management to themselves. To use this method, records managers should ask several questions and engage in two-way conversations with regular employees. For example, a records manager at a university can ask an administrator, “What bothers you about the current student records system?” A possible answer might be, “I dislike it when I ask for a student record and it takes a week for the student services department to respond, then when I get it, the file’s incomplete.” This answer highlights the value of an electronic records management system with a searchable database, which the administrator identified in her own way. The task of explaining records management to regular employees is not always easy, but it can be done. To make the job of the records manager even easier, organizations should implement a records management system that is systematic, organized and easy to use. Learn more here.